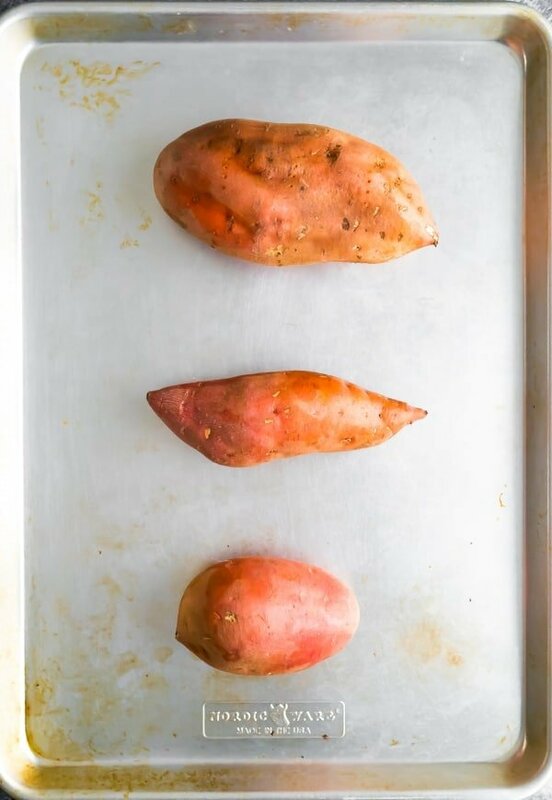 How to bake sweet potatoes- a step by step guide to getting perfectly tender baked sweet potatoes! Eat them for dinner, stuff them with delicious fillings, or use them in your meal preps. Today we’re talking sweet potatoes, specifically: how to bake sweet potatoes! There are many ways to cook sweet potatoes, but baking them whole might just be my favorite way to do it. Psst! 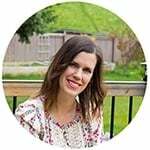 Check out these posts if you’re looking to cook whole sweet potatoes in the Instant Pot or slow cooker! you can use this baked sweet potato recipe as a base for a number of different recipes! You are going to love this ‘recipe’ for it’s simplicity! All you need is an oven, a baking sheet, and a sweet potato! Scrub your sweet potatoes and pat them dry. 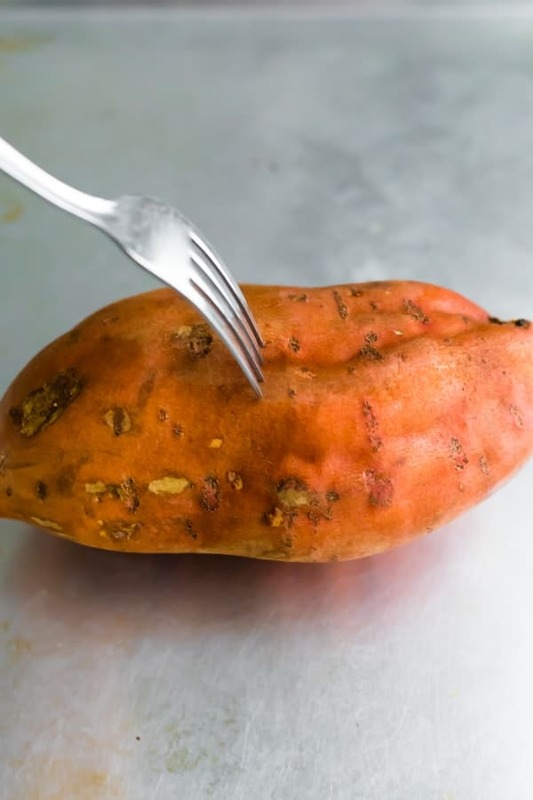 Poke holes all over the sweet potatoes using a fork. That’s it! 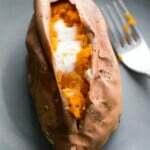 If you are wondering how to bake sweet potatoes, you have found the simplest method possible! Now how long to bake sweet potatoes is going to differ by each sweet potato, but I promise, this recipe is still really hard to screw up! The potatoes below were different in size but were still ready within 15 minutes of each other. If your sweet potatoes are quite small, you may want to even start checking them after 30 minutes. How to tell when your baked sweet potato recipe is cooked through? I like to call this the ‘squeeze test’. 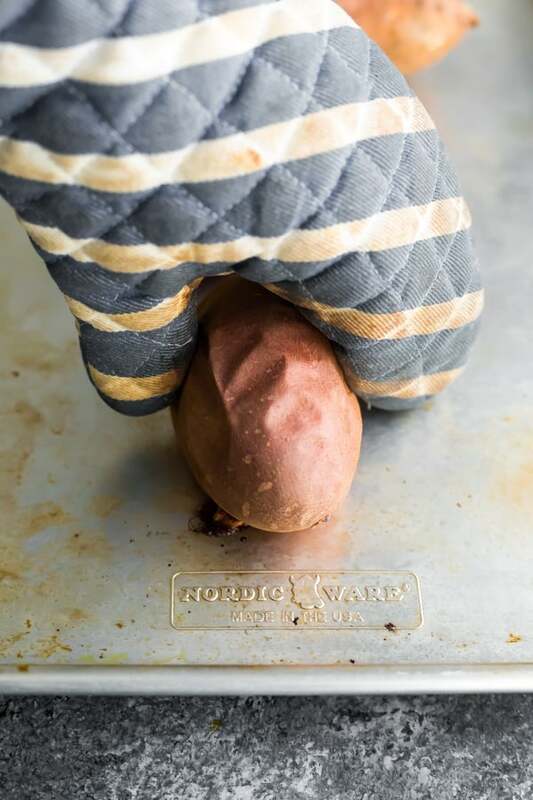 When you are wondering if your baked sweet potato recipe is done, give the sweet potato a little squeeze (with an oven mitt on!). If your baked sweet potato feels tender, it is likely ready. If it still feels firm, I’d put it back in the oven for another 15 minutes. Expert tip! Drop your baked sweet potato from about 10 inches above onto a cutting board or the baking pan. 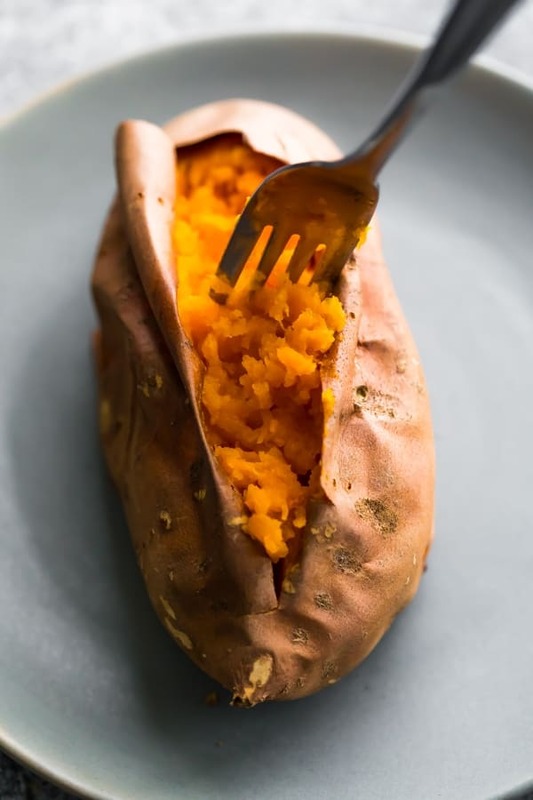 I learned this tip from Natalie at Tastes Lovely in her Steakhouse Style Baked Potatoes post, and it works great with baked sweet potatoes, too! 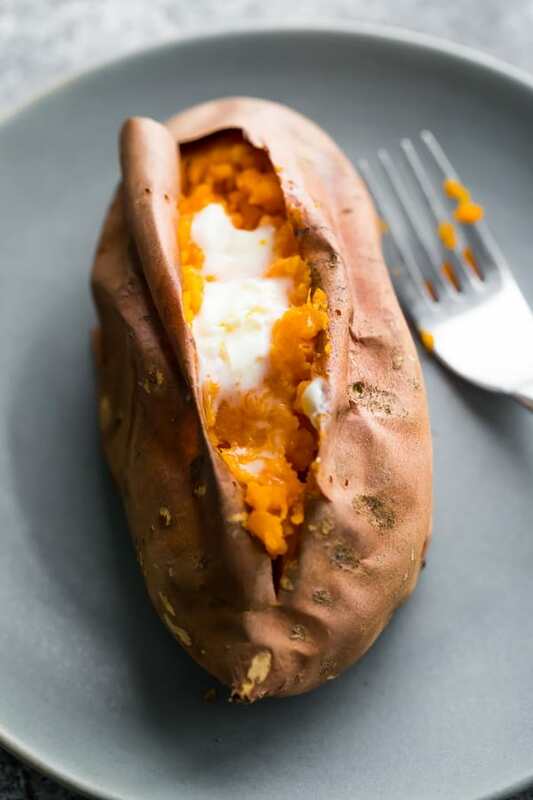 Dropping your baked sweet potatoes after baking loosens the insides up and makes it so light and fluffy! Can baked sweet potatoes be frozen? YES! One of my favorite freezer meal prep recipes are these Enchilada Stuffed Sweet Potatoes. Not only can they be frozen, but they can be baked in the oven without thawing! How convenient is that?! Do baked sweet potatoes need to be refrigerated? YES. I always store in an airtight container in the fridge. They keep for about 7 days if stored properly. Do you eat the skin of baked sweet potatoes? Absolutely! We enjoy the sweet potato skin, but some people prefer to peel it off. As you can see from the photo below, this baked sweet potato recipe is extremely easy to peel once baked. What are some ways I can serve this baked sweet potato recipe? This baked sweet potato recipe is so versatile! You can serve it as a simple side dish, or stuff it with some protein and turn it into a full meal! you can also cook your sweet potatoes in a slow cooker or in the Instant Pot! 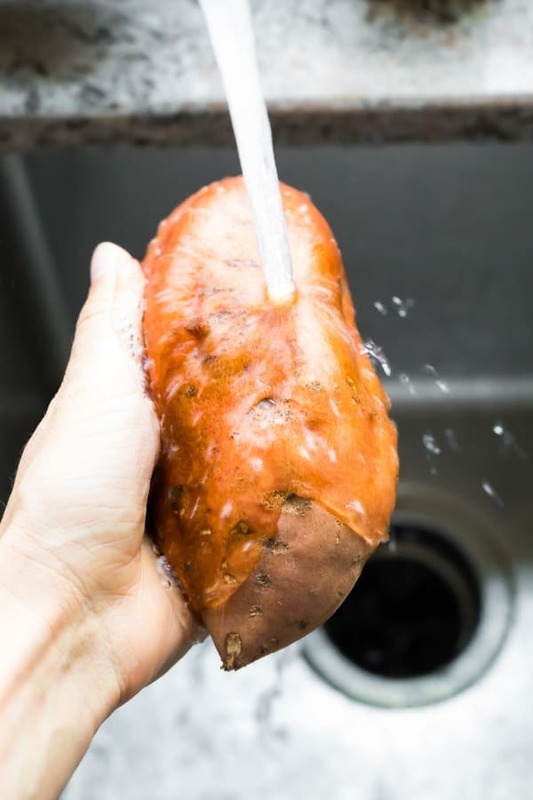 Scrub your sweet potato and pat dry with a towel. Prick sweet potato with a fork 10 or so times. Test if your sweet potatoes are cooked through by gently squeezing with an oven mitt. If they are tender, they are ready to serve. If they are firm, return to the oven for another 10-15 minutes. Before serving, drop the sweet potato from around 10 inches above a cutting board or the baking dish.